What is a "Multi Viewer" ? 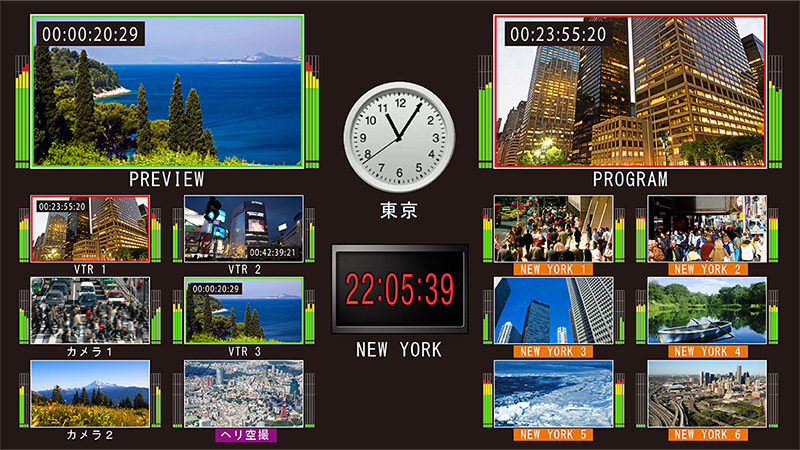 Multi viewers consolidate multiple video sources for display onto a single monitor. Both standalone multi viewers and equipment that integrates multi viewer functionality are available. Monitoring by those who worked with only a few video sources was once possible by setting up a monitor for each source. But as more video sources are used—along with a mix of signal specifications, from SD and HD to 4K—deploying a monitor for each source or specification has become impractical. Now, you can arrange a multi viewer environment with a single, large screen to efficiently monitor multiple sources at once, no matter how many sources or specifications are used. The broadcast industry is not the only market for multi viewers. Besides monitoring multiple sources in sub-studios, current applications include monitoring security and medical video feeds. Multi viewer displays are also customizable. Windows can be resized according to the role or priority of sources, and clocks, time codes, tallies, or other information can be added as needed in monitoring.